The Manfrotto 175F Justin Spring Clamp is a must have for on the go professionals looking to quickly set up a flash in a easy way. Simply connect your 580EX II or SB-900 or whatever flash you use to the hot shoe adapter and then clamp the unit to what is around. This unit is particularly useful for wedding photographers or studio photographers looking to add another light with ease and add a punch to portraits. Video shooters can attach a Micro Pro or a external Sennheiser ME66 to achieve quality lighting and audio without having to weigh down the DSLR. 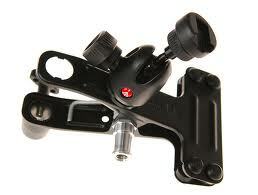 The Manfrotto 175F clamps onto pipes up to 1.6" in diameter, or stands or arms that have a 5/8 in top, or 3/8 in thread. The 0.7 lb clamp also features a cold flash swivel shoe for attaching a shoe-mount flash.